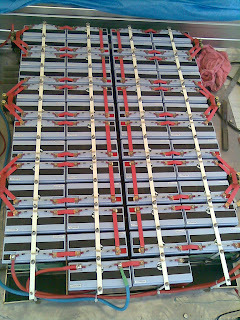 Malcolm Faed's Blog: All battery interconnects are installed and wiring done. All battery interconnects are installed and wiring done. This weekend I installed the battery interconnects. They are made from copper sheet, cut into 12mm strips and drilled. All the straps are n shaped so they will allow a little battery movement. This is to prevent the battery terminals from working loose. The cables are 16mm^2 . Overkill but free. The contactors along the side are double pole. These are used to break the battery bank into 12 x 48v blocks and on 24v block. This makes it save to work on. I tested each contactor separately with my cable shears at the ready in case I had made a terrible mistake. Thankfully they were not required. Across any contactor there can only be 48v max so it is safe to work on. The stainless steel battery clamp strips are covered in heat shrink to give as much insulation as possible. Each battery has the zener-resistor balance circuit connected across. Next step is to put the +- 300v cables and interconnects to the VFD into orange plastic tube. and begin connecting the controls. (throttle, reverse lights, direction switch and VFD display. Then the chargers and fuse holders for the chargers. Mal, congrats to big progress again! I'm wondering do you plan to put your VFD on some sort of anti vibration thingy, rubber mounts as seen for machinery etc.? At the moment it is mounted rigidly. Good suggestion, I can still put some rubber under it.